Ambar palace is situated in Amber, the former capital of the Kachhwaha Rajputs on a hillside overlooking Maotha lake, 11 km from Jaipur on the Delhi - Jaipur road. Its construction was started by Raja Man Singh I, army commander of Mughal Emperor Akbar in 1592 and was completed by Mirza Raja Jai Singh and Sawai Jai Singh, over a period of about two centuries. It is a classic fusion of Mughal and Hindu architecture, built in red sandstone and white marble. The palace or the royal apartments lies inside the massive Amber fort complex with gateways, gardens, halls, stairways, pillared pavilions, temples and palaces. Some of the noteworthy architectural marvels in the complex are the 'Diwan-E-Khas', the 'Sheesh Mahal' and the 'Jai Mandir' with exquisite mirror work, the 'Diwan-E-Aam', the 'Sukh Niwas', the Shila Mata Temple and Kali temple and the well laid out garden the 'Kesar Kyari'. 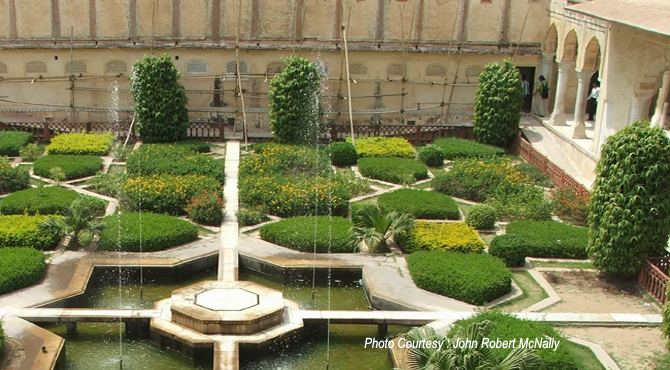 The fort is entered through the 'Dil-e-Aaram' Garden, laid out in the traditional Mughal style. An imposing flight of stairs leads to the 'Diwan-E-Am' (hall of public audience) which has latticed galleries and double row of columns each having a capital in the shape of elephants on the top. To the right are steps that lead to the small Kali Temple. Maharaja Man Singh was a great devotee of Goddess Kali and prayed to the goddess for victory during battles. The temple has huge doors made of silver. The larger white marble Shila Mata temple, has the image of Goddess Kali, brought by Raja Man Singh from Jessore in East Bengal (now Bangladesh). The emperors apartments lies on a higher terrace beyond a two tiered decorative gateway, 'Ganesh Pol, covered with elegant frescoes and pavilions having fascinating jali (Lattice worked) screens. The 'Jai Mandir' (hall of victory) has a glittering ceiling with mirror pieces on stucco and elegant inlaid panels. The 'Diwan- E- Khas', hall of private audience is similar in ornamentation to Jai Mandir and the 'Seesh Mahal', hall of Mirrors known for its craftsmanship in mirrors, is the most spectacular of the lot. Thousands of mirror pieces adorn the walls and the ceiling that, any streak of light makes them sparkle and illuminates the entire room. In front of the Jai Mandir is the 'Sukh Niwas' (hall of pleasure) with a door made of sandalwood, inlaid with ivory with a channel running through, which formerly carried cool water acting as an air cooler. The zenana or the women's apartments and frescoes depicting Krishna Leela scenes surround a spectacular courtyard. There are private chambers from where the royal women could watch the proceedings of the royal court in privacy. The well-proportioned garden, Kesar Kyari in the center of Maotha lake and the Dilaram Bagh at its north end provide a spectacular view of the palaces.